If you just see this as a go-fast, extremely well-performing pontoon you’ll be selling it short. 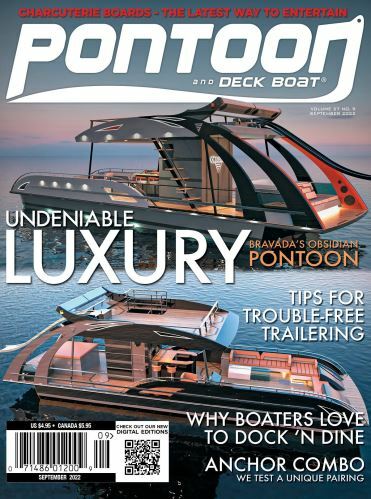 There is a lot more to this well-built pontoon that was thoughtfully designed and it is loaded with an impressive list of standard features and key options. This Manitou was designed not only to be fast, but also to look sporty as well and it starts with the full wraparound windshield that perfectly ties in the two helm stands with a folding door in between to help block out the wind. Both the captain and the first mate have identical flip-up bolster helm chairs with compartments built into the dash design with USB auxiliary ports and 12-volt outlets as well as access to the JL Audio sound system (first mate with a stereo remote, captain with the actual unit). With the two can speakers on the sport arch tower there are a total of eight speakers plus a subwoofer, proving the engineers at Manitou understand how important music is to boaters. For the captain is an Evinrude touchscreen so the driver can keep an eye on everything and stay completely in control; below the screen are toggle switches that are all well-labeled. One key option on this boat is the new iDock joystick that recently earned an Innovation Award by the NMMA. You can dock like a pro just using your fingertips and it’s not an upgrade that will break the bank either. With the removable bench seat you can convert the bow area into a nice U-shaped seating area and we really have to credit Manitou for the extra mile effort on the vinyl design. The stitching is amazing and the textures and patterns flow well with the layout. Hidden below the port chaise is an easy-to-use pop-up changing room that stands nearly five and a half feet when open. The two rear-facing lounges in the stern are extremely comfortable with great storage below, and speaking of storage, the in-floor ski locker is over 2 feet deep and over 7 feet long so there is plenty of room for your toys. The Sport Handling Package (SHP) is a unique hull design that includes two 25-inch diameter pontoons and a 27-inch diameter center log with positive angle lifting strakes on all three. There is nearly 20 feet of deck space from inside the bow gate to the stern with an impressive amount of extra space on the bow platform as well as part of the swim deck in the stern. What can you say about a 600hp pontoon that is capable of speeds over 60 mph with a hull that allows you to turn on a dime? Well for starters, how about saying thanks to Manitou for building such a fun boat to drive! Equipped with twin Evinrude 300 E-TEC outboards, we jumped from zero-to-20 mph in less than four seconds and we never got tired of banking into sharp turns with this proven hull design. The ski/tow bar plus the sport arch will get plenty of use on this model. There are quite a few features including the twin engines that drive up the overall price tag, but for those in the market for a high dollar luxury pontoon they really do make a big difference. This is a well-constructed pontoon that is in a class of its own and it’s hard to beat the overall package as tested. Why we love this boat…It would be easy to say the performance was our favorite, but we also love the way it’s geared towards music and electronics. Just being picky…The back rests in the stern are a little low towards the gate, but it’s nothing to be too concerned about since there are plenty of comfortable seats onboard. Stainless steel lighted blue LED cupholders, custom marine vinyl, extended starboard chaise, chaise w/flip-up arm rests, portable cupholders w/stainless inserts, privacy station assembly, powder coated aluminum Bimini top w/LED lights, color-matched mooring cover, hybrid Rotomolded furniture, anti-spray integrated splash fins, full-length pontoon tube riser, helm chair w/slider/reclining high back, Manitou Smart Screen at helm, wide four-step ladder, Gussi 930 steering wheel, Simrad GO 7, fiberglass rear pods, blue exterior lights, blue LED lights, JL Audio system, hydraulic power assist steering, ski tow bar, six Kicker LED speakers, and AM/FM Kicker Bluetooth radio. In-tube storage, sport arch, can speakers, and joy stick.